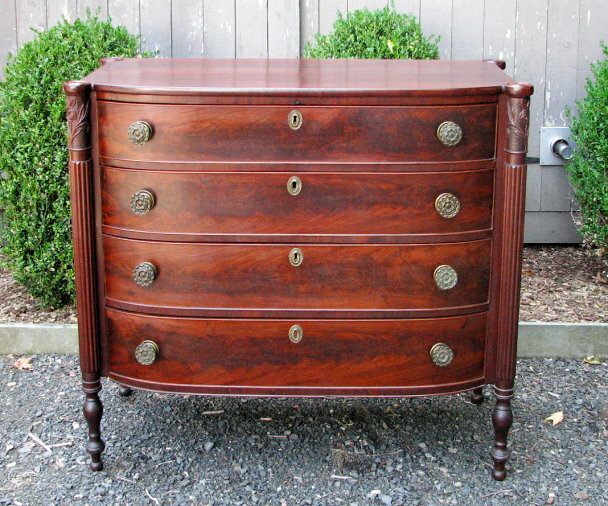 Very fine sheraton carved and figured mahogany four drawer chest, with elliptical bowed front with ring turned extruded cookie corners, above rose carved and punchwork capitals above reeded colonettes continuing to turned legs ending in ball feet, with four graduated cockbeaded drawers. Salem, Mass. circa 1815. Attributed to William Appleton. Original condition and rich original color, with apparent original hardware.